It’s a bird! It’s a plane! No, it’s a Superfood! A superfood, according to the Oxford English Dictionary, is a food considered especially nutritious or otherwise beneficial to health and well-being. Incorporating superfoods into your daily diet brings many benefits to your body. 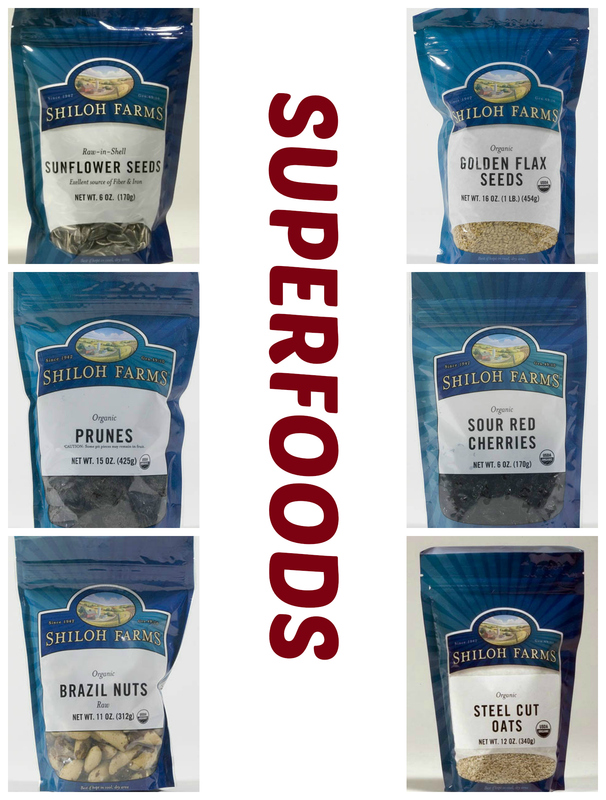 Here’s a selection of our favorite Superfoods that are available on the Shiloh Farms website! Dried Plums (Prunes)– Prunes are loaded with plant chemicals that have been shown to boost bone density by stimulating your bone-building cells. Walnuts- One serving of walnuts provides more than twice your daily dose of omega-3 fats that have been shown to improve memory and coordination. Steel-cut oats- These oats are less processed than traditional oats, so they’re digested more slowly, keeping you full longer. Brown rice– A great source for whole grains and magnesium, brown rice helps your body convert food into energy. Sunflower seeds– A quarter-cup delivers half of your day’s recommendation of vitamin E, which keeps your heart healthy and fights infection. Flaxseed– Has more compounds that may prevent endometrial and ovarian cancer than any other food. Dried tart cherries– Cherries have been known to help control blood sugar, reduce insulin and lower cholesterol. Brazil nuts– One nut delivers your entire day’s worth of selenium. Add these Superfoods into your diet and transform into a Super YOU! For more great tips and recipes, follow our Pinterest Board: It’s a Superfood! ← FDA Officially Defines Gluten-Free!